This property is located in the heart of Seoul Center, with easy access to public transportation such as the Subway (Hansung Univ Station, line 4, Exit 5) and many major city bus routes and also the airport limousine bus (No. 6011). B&J is also located nearby Seouls Fortress, built in 700 years ago and preserved by Seoul City. Just step out of the B&J, you will be already in a locally famous fortress route. Besides, you can reach those major shopping areas such as Dong Dae Moon Market, Myeoung Dong and Nam Dae Moon Market within 10~15min by the subway. B&J also provides Free Breakfast, Free Laundry and Free Internet Access. B&J Guest House believes in traveling eco-friendly. Please bring your own personal hygiene products such as tooth brushes. We don't provide any one-time-use products. We do offer market priced products which, if purchased, please re-use them. B&Js Smiling Staff or family member is fully trained in helping guests and they speak good English. B&J will promise your comfort stay at B&J Guest House. * DVD new moives (free). The trip takes 1hr to 1hr 20 min. so relax and enjoy the views. The bus will either display the location stops on screen or read out aloud in English so you can see where you are on the maps. b) While on the bus, the stop you need to get out at is located on a main road. On your left you will first see a 'Macdonal' then you will get off from the bus. If you could not contcat us before your arrival, then you need to find out public phone booth located in front of 'Macdonald' or simply borrow a mobile phone from someone on the street.. most of Korean have thier own mobile phone. Then you can phone us under 02-744-9000. I will be there within 5 miniutes to pick you up. ** If you want to find our place yourself, which it would be very challenging..
2. Cross the street toward 'Macdonald' and turn let and keep walk straight toward Hansung University Subway station(한성대 입구역). and plz find out Exit 5 of Hansung University Bus Stop(한성대 입구역). 3. Once you find out Exit 5, there will be C&U(24hr Convinient Store) and if you face C&U and turn left to the corner of the junction. you go straight for about 50 meters (on the way you could see: a traditional Korean costune shop and small unknown Korean restaurants, as well as motobike shop etc). Move your steps until you get SAMHWA-Painting shop on your right side. 4. At SAMHWA-painting shop, stop your step and you will find a old city wall at front, there are two side streets on your right side, take one has little hill and look upward to see the Beautiful Old Gate (unique feature in this area). Walk toward the old gate.. plz do not take the other street(one way). 5. Take about 30 steps and find a tiny park with gazebo on your left side, at the end of a tiny park, you turn right and you will see our sign 'B&J GUEST HOUSE' and it will be there for you..
*caution* from the exit of subway if you see 'C&U (convinient store)' on your left side, plz turn back.. otherwise, it leads you to the wrong direction. 1. Start at Hansung University Subway Exit no.5. From Exit no.5, you need to just turn left toward main road and see 'MOMENT BAR' on your right side. At the same time, you can see 'KIA Motors and S-Oil' on the opposit side of road. 2. When you see 'MOMENT BAR'and 'Beautiful Store'located just next to 'MOMENT BAR', you go straight for about 50 meters (on the way you could see: a traditional Korean costune shop and small unknown Korean restaurants, as well as motobike shop etc). Move your steps until you get SAMHWA-Painting shop on your right side. At SAMHWA-painting shop, stop your step and you will find a old city wall at front, there are two side streets on your right side, take one has little hill and look upward to see the Beautiful Old Gate (unique feature in this area). Walk toward the old gate.. plz do not take the other street(one way). 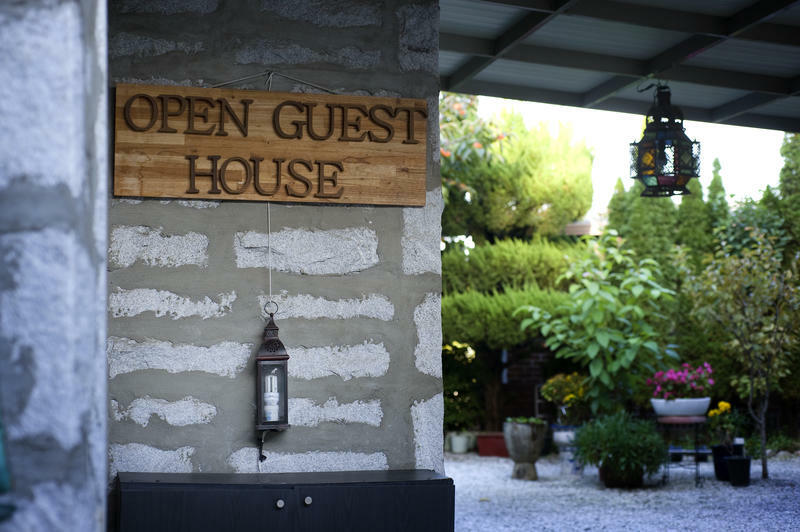 Take about 30 steps and find a tiny park with gazebo on your left side, at the end of a tiny park, you turn right and you will see our sign 'B&J GUEST HOUSE' and it will be there for you..